I was so, so hoping that someone would take up the Edmund-Bertram-is-the-worst mantle and wear it proudly...and Nancy Kelley, author of His Good Opinion and Loving Miss Darcy was more than happy to do so. Edmund-lovers: I'm ready to hear your defenses and excuses. AKA, Why Edmund freaking Bertram is the problem with Mansfield Park. When I started Mansfield Park the first time, I remember saying something really positive about Edmund a few chapters in. After all, he's the only person in the Bertram family who cares about Fanny at all. Here she is, a poor 10 year old child away from her family for the first time, and no one else even thought she might like a cry? Edmund the hero! My friend’s reaction was... reserved, shall we say. A few weeks later and a dozen chapters in, I understood why. His character doesn't evolve--it devolves. He starts out sweet and caring, but then when Mary Crawford shows up, it all goes out the window. Let's take a look at this, shall we? I'll preface the list by saying most of this lameness stems from Mary Crawford. Edmund's lameness is directly linked to his infatuation with her and his total, willing blindness to her true character. It is the height of lame-o-sity that he actually thinks she is a good choice for a clergyman's wife, when she all but runs screaming from the very idea. 1) Forgets Fanny needs her morning rides for her health because Mary would really like to go riding. This despite the fact that he went against the wishes of his mother and aunt to buy the animal for Fanny's express use. Lame! 2) Leaves Fanny sitting by herself in a garden she's not familiar with, promising he'll only be gone a few minutes. He never comes back--she finds him later cozied up with Mary. Lame! 3) Encourages Fanny to marry Crawford, even though she's stated she has no interest in him. Acknowledges that the man has his faults, but tells Fanny she can fix him after they're married. Lame and wrong! 4) When Mary begins to show her true colors in London, Edmund sends Fanny a letter, moaning about how he's wounded, but he will carry on in pursuing her. He adds another "Hey, you should totes marry Crawford" dig in here too, even though Fanny has been as firm on this point as Fanny ever is. Lame and clueless! 5) After Fanny returns to Mansfield following Maria's downfall and Tom's illness, Edmund takes her aside and whinges about how Mary hid her vulgarity from him. Never mind that in the aforementioned letter, he actually talks about her "weakness," so he knew very well what she was like! Lame and stupid! 6) After dumping Mary, he goes back to Mansfield all sad and woebegone. Spending time with Fanny cheers him up, and after a while, he looks around and thinks, "Well gosh! I really want to get married, and my first fiancee turned out to be not so great. Here's this cousin who's pined after me her whole life, why don't I marry her?" So totally lame, there isn't even a word for it. This is the character arc of Edmund Bertram. He goes from completely sweet older cousin to a man who sees a young lady who adores him as "good enough, I suppose." He has the potential at the beginning to be a hero in the model of Henry Tilney--protector of youthful innocence, etc--and ends up... well, lame. He lacks Darcy’s willingness to change for his lover and Wentworth’s undying love. (He can’t say, “I have loved none but you,” after all.) He doesn’t even have the quiet passion of Colonel Brandon, or the humility Edward Ferrars showed in admitting he was wrong to engage himself to Lucy Steele. The way his relationship with Mary Crawford falls apart is all about her–he admits he was wrong about her, but he does not then admit he was wrong to pursue her. It's a commonly held opinion that the problem with Mansfield Park is Fanny. Her too-perfect character drives readers away. However, I think it's Edmund's total lack of heroic qualities that keeps people from engaging in the story. Fanny may annoy you, but she definitely deserves better than a lame hero who spends 90% of the book forgetting about her. A-FREAKIN-MEN. 100% agree with this assesment. It frusrated me to no end how he just settles for Fanny when I am sorry, but that poor girl could do a million times better. I have not read Mansfield Park, but I totally get how bad a lame hero can be. This guy sounds like a real loser. What a fun post though! 1. Sometimes the person you admire as a child grows up to be less than you expected. We all have a choice about whether to keep that love, or hold tight to the standard this person once set for us. Fanny's choice might not be one you or I would make, but there is a whole subset of people who make that choice everyday. 2. I have known some exceptional women who loved lame, wrong guys. Not because they married beneath them (as all women do, according to some satirists), but because they felt that the chasing-Mary-Crawford loser period was just a phase. When the phase ran its course and the guy came back and said "why not? ", these women jumped. Is it perfect? Is it happy? I don't know that we can say that from an outside perspective. From what I have seen, though, this early acceptance of imperfection has helped these relationships develop into lives that nurture a lot of other people. 3. As readers, we tend to expect characters to show us flaws, and then get over them in the course of the story, so that they can lead presumably idyllic lives after the last page. Austen wasn't catering to that set of expectations--which is probably why her stories are found in the literature section of the bookstore instead of the romance section. To demand Edmund be a hero when Austen was simply trying to write him as a man perhaps blinds us a little. 4. The very dramatic events of some of Austen's more beloved stories are often the result of outside forces at work on the characters. If Darcy hadn't come to Netherfield with Bingley, how might the Bennets have fared in their interaction with George Wickham? If Mr. Dashwood hadn't died, would Elinor and Marianne ever have encountered Edward, Col. Brandon, the Jennings, or Willoughby? In Mansfield Park, though, the external forces dovetail themselves so insidiously with the inner workings of the family and its estate that the choices are less dramatic. Not less important (or difficult) for the characters who must make them, but certainly smaller. Good choices and bad ones are often found in small steps, and big drama is more likely to reveal choices already made than help someone come to a correct conclusion. I couldn't agree more, Lex, but it doesn't make it any less frustrating. I don't think it would be as frustrating if it didn't seem like the world wants us to be happy for Fanny. We're taught to rejoice - she got her man - but we're left so dissatisfied. I do think Austen intended this, in some ways. But I also have a feeling that she was maybe more forgiving of some of Edmund's traits, as many of the things that bother us wouldn't necessarily be relatable scenarios now - we do have the option to strike out on our own, to make our feelings known, to pursue the man if we choose, etc., in ways they wouldn't have dreamed possible. And yet, it DOES still remain relatable, and I think this is very much IS a study in human nature, which will always translate and get under our skin, no matter how much times change... and a very well-done one, at that. Still can't bring myself to like Edmund, though. I think you're probably right in all your points. Mansfield Park is just such a difficult book for me--there's not really a single character that I honestly like, besides Fanny. And Fanny is a much more passive heroine than any of the other Austen women--even Elinor does more for herself than Fanny does. Additionally, the undercurrent of child neglect bordering on abuse that runs through this book takes some of the joy out of the story. When you already have all those difficult elements, it would be nice if there was one positive thing to latch onto. I know that in real life, lives don't make the kind of dramatic turn arounds we see in fiction, but as Beth said below, that's why real life doesn't make for good books. 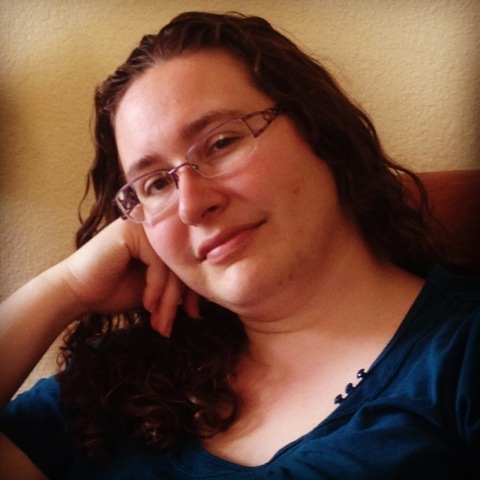 In fiction, I want to see the main characters overcome their weaknesses and become better versions of themselves. I want to see the villains vanquished and true love conquer all. I should add that while I love all the rest of Jane's novels and quite a few other classics, I don't tend to read literary fiction because it *does* depict normal life without those satisfactory conclusions. OH MY GOD, Lex, don't even get me STARTED on Rochester! I refuse to read Jane Eyre because of Rochester. The very idea of a man allowing--no, encouraging!--a young lady to fall in love with him WHEN HE'S ALREADY MARRIED makes me froth at the mouth. I know the story is about Jane and how strong she is to walk away from him, but I really just want to hit him. I see Edmund as the classic young man who falls for beauty over character, as many men do. 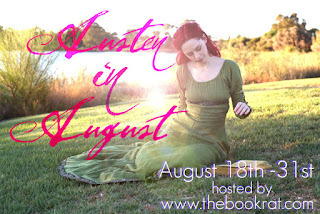 It's a theme Austen explores in most of her books because it's such an enduring problem. It makes it harder for women who are less attractive but possibly far better people and partners, and it means many men make bad marriage choices because they didn't take character into account, when character comprises the majority of a life-long marriage. Though an intelligent young man of high integrity, Edmund cannot see this one. I makes him blind. It's his character flaw. I don't think his detractors are taking into account that these two grew up together. Though a favorite trope of historical/romance fiction, how many people fall in love with someone they've grown up with like a sister since childhood? Edmund's parents even say so, that by their growing up together, we won't have to worry about a romantic attachment. For Fanny, we understand her feelings more because he's the only person who treats her well, and that kind of gratitude can convert to another kind of love, but it's completely different for Edmund. He is fully expected to look about him for a wife of class and means. Then his romantic sensibilities are inflamed by the play, which we must remember was much more 'exciting' back then than we would see or experience it today. The only flaw in their storyline is that he overcomes his flaw so quickly and at the very end, so it isn't nearly as believable and satisfying as it could have been if we'd seen him undergo the change more on the page. When you start bashing Rochester, I'll be there in defense of him, too [smiley]. It is hard to argue against the fact that, as a hero, Edmund is pretty lame, and Mansfield Park would be more romantic if he was a stronger hero figure. In his defence though, he does acknowledge he was wrong and thoughtless towards Fanny in the horse lending incident. Also, it says in the book that, if he'd married Mary then very likely Fanny would have married Henry Crawford so I don't hold that supposition against him too much, aside from the fact that it shows that he is blind to how Fanny's opinion isn't prone to changing, doesn't he know her at all? For me though, Edward is worse because he lets Elinor fall in love with him knowing all the time that he's engaged and she deserves better than that. At least Edmund was honest in his intentions. Wonderful counter argument Lex! Lots of points I wouldn't have thought of. I agree with you that Austen wasn't setting out to write a really romantic book, but more of a study of human nature, and nature v nurture. 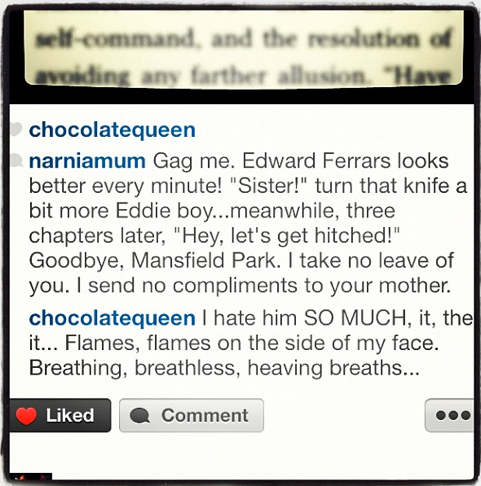 Oh, you don't want to get me started on Edward Ferrars and how wrong he was to do that. I have a personal thing about men who encourage women to fall in love with them even though they know they aren't free. It's why I've never and will never read Jane Eyre. But at least Edward comes and makes an abject apology. Edmund never acknowledges that his whole pursuit of Mary Crawford was folly. Can I tell you a secret? I'd be happier with MP if Fanny had married Henry and reformed him. In a way, i would too. But I think I would rather Henry met somebody else who could reform him. I think Fanny would have bored him after a while and he'd be off eloping with married women again; I feel she's not interesting enough to keep his attention, which would obviously leave her unfairly abandoned and distraught. I think she and Edmund would be quite happy together but I can't see there being much excitement in their subsequent story. YES! This, so much. I admit, ashamedly, that part of my issue with Fanny as a character is that she has such poor taste in men. She's pining after Edmund and loyal to him, although he clearly doesn't deserve her. I think their marriage would be stale and rather joyless, honestly, once the novelty of it wore off. Poor Fanny. Of course, as Lex said, that's realistic....and reality doesn't necessarily make for good fiction. I read a lovely short story depicting their married life--I think it was in Jane Austen Made Me Do It. Honestly, I think that once they get past the events of that year and remember who they are and that they've loved each other for a long time, they'll be happy together. It will be a quiet life, because they're both quiet people. But that's okay, if that's what you want. In this story, I feel like there are so many exceptions to the modern norm that cause such ambivalence toward it. I actually don't think we can understand it well if we're not willing to get past modern thinking about class, culture, family, and relationships. Personally, I don't feel as strongly about Edmund one way or the other. I was always curious about how he drew Mary Crawford's eye in the first place after she had spent time in town around men like her brother and Tom Bertram who sparkle with fashion, wit and future prospect even with their flaws. There must be something about him to draw the interest of two very different women. I loved Nancy's argument and reading everyone else's comments. Thanks all! I love having all these new things to think about re: MP. I'm pretty sure he must have been extremely good looking. Plus, he was head over tails in love with her, and that's quite appealing. Also... he was good. If you read between the lines of Mary's life, she hadn't often been treated with kindness, and probably never from a man. Even if she thought he was a bit dull, she'd never have to worry about him yelling at her, or belittling her, or beating her. I hate Edmund. So much. What a great point Sophia Rose. That Edmund clearly has something going for him to gain the attraction of two hugely different women. Whatever that is though, it doesn't translate to my modern brain. Even so, at the end of the day, I find most of the characters big fat mehs. Fanny isn't just a wimp; she's a wimp who almost revels in her nothingness. Honestly, if you're such a big zero Fanny, why are you even lusting after Edmund? She sits around waiting for him, treasures a note she well knows is nothing more than an affection letter from a "brother." And she's not even lusting after Edmund, she's longing for the fictional Prince Charming version of him. The one she created in her imagination when he did what? Oh talked to her and gave her some paper. That isn't even that remarkable of a kindness. In fact, it's only a kindness of note because everyone else is even worse. Where was the demand that she have a horse when she was a girl? Where was the conversation with his father about how Mrs. Norris is straight out abusive to Fanny? Where was the remark that she doesn't have an effing fire in her left over "east room?" Why aren't the real crimes towards Fanny addressed by this supposed hero? And wouldn't Fanny be far more relatable if she had some good honest lust? It so irritates me despite Henry's admittedly horrible actions that MP doesn't end with Henry having a sincere repentance and in so doing cracking the soggy heart of Fanny and pulling from her the same adoration she has for William with a big dose of he's-not-my-brother-lust. I want her infatuation with Edmund to be something that she and Henry giggle over in a giant bed, next to a roaring fire, before they travel to the south of Italy to enjoy the sand. Except a part of me doesn't, surely Henry deserves better? Horrible person though he is. Love isn't settling. Is it? Love isn't a dude being like oh yeah, Fanny. What an awful end. Oh yeah, Fanny. And then you get married and go on about your boring, passionless, life with no real heart. Sure, they'll always be faithful. Sure, they'll always think of the other. Sure, those are good things. But so too, is the love that you are sure Darcy and Lizzie have or Anne and Wentworth. And speaking of Anne, I can't help but feel that Fanny is nothing more than a poor-girl's Anne. She quiet; she's unassuming; she's unloved by so many. But somehow with Anne, it's a quiet goodness that makes me want to be a better human. And with Fanny? It makes me want to punch her in the throat. Fanny as a poor-girl's Anne... I've been thinking about that for two days. They have a lot in common, so why do we like Anne so much better? (Most of us--I know there are Anne haters out there.) Is it her position that makes her goodness tolerable? The fact that she's good in the face of so many supercilious people? Or the fact that she's so aware of what she's lost? Maybe the secret of Anne Elliot is her hidden strength. She finds ways to manage the people around her, rather than be managed by them like Fanny is. Though much of her management is listening quietly to their ridiculous speeches so no one else has to, at least she's doing something to maintain the family name. Fanny does nothing. I think one of the main differences is that Fanny almost seems to revel in being overlooked, sitting there like a limp lemon in Rushworth's garden when she's abandoned for an hour, she is happy when Crawford arrives back when she's due to eat at the parsonage so she can fade into the background, etc. Whereas Anne is overlooked just because her family are selfish; it isn't what she wants. I'm not saying that this is fair, but it's probably one of the reasons. As regards Rochester, he has convinced himself that he is free to honourably marry, he genuinely doesn't feel that he is doing Jane any wrong. It's such a good book, Jane is such an amazingly strong character. If you know details of Jane Eyre before you read the book it doesn't sound like it would be a good read, but it really is. That's a good point, Ceri. Fanny feels like she deserves to be ignored and is happier when she's left alone. Anne feels the sting, and so we sympathize with her. As for Rochester, I have too much experience with similar men to tolerate it in literature. AHH! I love the twitter references - you and Jess are so awesome and hilarious! Thanks, Meredith. The picture was Instagram-ception. 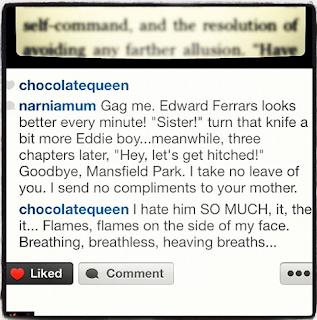 Jess Instagrammed a page from Mansfield Park, then I took a screenshot of the conversation and Instagrammed that. It has always bothered me that Edmund spends all of the novel being in love with Mary Crawford, and then finally deciding to marry Fanny in the last two pages or so. It does look like he's settling for her because he can't have Mary. Someone needs to write a "what-if" Mansfield Park story in which Fanny marries Crawford and Edmund marries Mary. I'd think Fanny and Crawford could be happy together (while Edmund and Mary probably wouldn't). If I could bring myself to spend the quality time with the book necessary to write a variation, I would be all over that. I agree that Edmund and Mary probably wouldn't be happy together in the long run. He was, as I mentioned above, the only kind man she'd ever met... but I don't think she could have tolerated life as a parson's wife. Hero doesn't necessarily mean knights in white horses, or gentlemen with 10,000 a year coming to the aid of foolish younger sisters. The hero of a book is--usually--the main male character, as the heroine is the main female character. Edmund qualifies for that role, as he is clearly the object of Fanny's desire, but his character doesn't grow throughout the course of the novel, as we expect to see in a main character. Great recap on Edmund. I'm rereading this book for AIA and continue to be disappointed by all the characters, but especially Edmund. He may be a more realistic or human hero, but for a male lead in a story about love, he stinks! He doesn't realize a good thing with Fanny when he has it and almost loses her completely by pushing her on someone he knows is unworthy of her. Why would he do that if he supposedly cared for her?!? The first time I read this book, I hoped Edmund and Fanny would get together for a happy ending, but now that I'm older I wish she would ditch that wet noodle and move to the Americas for a stronger man who appreciates her!!! I think part of the problem is that Mansfield Park isn't really a love story. The rest of Austen's novels have a strong enough romance that you can fairly catalog them that way, but MP is more a social commentary. It sheds light on several problems of the era--the vast divide between rich and poor, the way poor relations could be treated, the way children were often neglected, either by ignoring them or by indulging them, and the lack of a moral compass Jane saw permeating the upper levels of society. All of those things are stronger elements in the novel than the romance, and yet because the story ends with a proposal and marriage, our brains get tricked into believing it was a love story. In all honesty, I wish Jane had left the romance out entirely. I think the novel would be much stronger for it. I always get annoyed with Edmund - every time. He really needs to man up. I've only read Mansfield Park once many years ago. I do remember thinking Edmund was lame and how I didn't really buy the Fanny/Edmund pairing at the very end, even though I really enjoyed the book. But I'm thinking it's time for a reread and a deeper analysis the second time around. Great post! I don't have a problem with Edmund. There's a book called Murder in Mansfield Park by Lynn Shepherd and Mary is the good character and Fanny is the bad one who gets murdered. Emma is another character who supposedly a lot of people don't like. Oh... Edmund is one of the kind! I still dunno if I like him or not... he is so fickle! Edmund, Edward Ferrars and Edward Rochester... I wonder if there was some super bad 19th century lame guy that all the girls were in love with that made writers give their lame heroes E names? Anyway, I have a lot of issues with Mansfield Park but maybe Edward would have come off as LESS lame if he got over his infatuation with Mary sooner or if there was more development with his relationship with Fanny instead of waking up and realizing he loves her. I absolutely think he would. If he'd started to gradually realize, beginning with her first comment about preachers, that she wasn't right for him, and totally quit her by 3/4 through the book, he'd be a much stronger hero. And I LOVE the idea that there was some real life bad boy with an E name who inspired all these lame heroes!